Hi, I am interested in your 1961 Jeep Other Jeep Models (stock #WWVA581.KT) listed on Autotrader for $13,900. I'd like to get more information about this vehicle and confirm its availability. 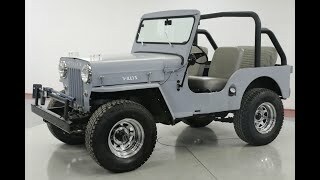 Willys was a brand name used by Willys Overland Motors, an American automobile company best known for its design and production of military Jeeps (MBs) and civilian versions (CJs) during the 20th century. In 1908, John Willys bought the Overland Automotive Division of Standard Wheel Company and in 1912 renamed it Willys Overland Motor Company. From 1912 to 1918, Willys was the second-largest producer of automobiles in the United States after Ford Motor Company.